The Tower Room is our smallest room but it's perfectly formed! Located next to our UUK Boardroom on the 1st Floor it works perfectly as a breakout space for meetings taking place in the UUK Boardroom or as a stand alone meeting space for a maximum of 12 in a boardroom style. The room is flooded with natural daylight with secondary glazing and air conditioning ensuring the perfect conditions for your meeting. The room comes with a flipchart included and a 55” HD LCD screen included in the hire fee. 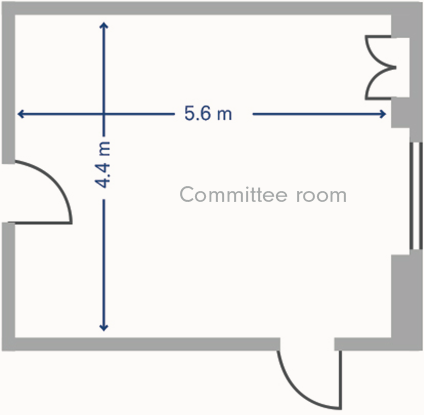 The room is 5.6 x 4.4 (LxW) in size. A range of catering and AV services are available in the room. The furniture arrangements detailed are the standard layouts. They may be varied according to your needs but must comply with Health and Safety Regulations. The Bookings Team are available to assist with planning these arrangements.